This post is the fourth in a series of blogs introducing the 12 teams participating in the 2018 Wood Stove Design Challenge in November. with the Englander-30 NC stove. With the 2018 Wood Stove Design Challenge taking place on the National Mall this November, it is only natural that one teams is only a couple metro stops away. 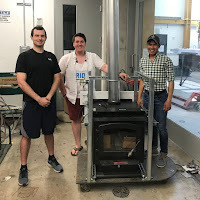 Students from George Washington University School of Engineering and Applied Science’s Department of Mechanical & Aerospace Engineering (GWU SEAS MAE) have been hard at work developing a thermoelectric stove. Students from this department are more likely to work on nanotechnology in solar panels or landing spacecraft on Mars, but it turns out, getting a steady flow of reliable electricity from a wood stove is just as challenging. What started as a class assignment quickly became an imperative learning experience for team members, Alexus Camero (‘18), Connor Itani (‘18), and Jack Eaton (‘19). As students in the Department of Mechanical & Aerospace Engineering, Alexus and Connor both took a thermo-systems design class taught by Professor Saniya LeBlanc. With Connor’s interest in green electricity and Alexus’ major relating to heat transfer, the duo took on the task of creating a thermoelectric stove to bring to the competition this November. With the necessary grants in place, and a stove donated by England’s Stove Works the Team began designing their thermoelectric generator (TEG) stove in the Fall semester of 2017. Later, their Team grew a little larger, when Jack Eaton joined Alexus and Conner working in Professor LeBlanc’s lab. Jack says that he was personally drawn to this project for two reasons, one being that “working in his advisor’s lab gives him a lot of autonomy”, something that is invaluable for an innovative college student, and second that he “spent every winter in middle school and high school in New Hampshire and knows many people that use wood stoves and struggle to pay their heating bill.” Jack, Alexus, and Connor all have personal, academic, and innovative drives for this challenge, which has kept them determined throughout the development process. 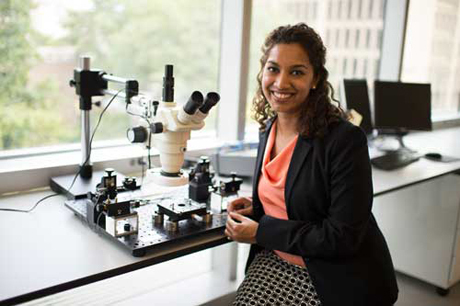 The team has been working with Professor Saniya LeBlanc to design and create the most efficient thermoelectric stove possible. As of now, their model is using thermoelectric modules by TEGMART that are designed to produce a maximum of 200 watts of electricity under optimal heating and cooling conditions, which is 86° F (30° C) for the cold side and 572° F (300° C) for the hot side of the module. Achieving these optimal temperatures in real life applications is a major challenge so actual power output is expected to be substantially less than the rated power. The Englander 30-NC in the lab. Not all their challenges are technical. Operating a wood stove in downtown Washington, DC required the Team to maneuver through a number of school and local government hoops to get approval for testing their stove. Nevertheless, the team has recently finished this taxing process and is on to the testing phase. But, the testing phase has its own challenges as well. The team recognizes that their stove’s heating and cooling system will require substantial improvements if it is going to maximize the TEG’s power output. As of now, the TEGs are located on the steel stove top. Steel is not as good a conductor of heat as aluminum, so the Team will be conducting tests to determine if there is sufficient heat flow through the steel stove top. The cold side of the TEG is cooled by water that is pumped through a 3 foot long baseboard heater. However, the team is exploring the option of adding a fan to improve cooling. In a home setting, the water could be pumped through baseboards located in multiple rooms, which would allow for a much greater release of heat to cool the return water. The trio is excited to showcase their model at the challenge to show how they retrofitted the EPA certified Englander 30-NC stove to make electricity, and “limit the amount of heat that is lost” to improve the overall efficiency of the stove. However, this competition also has personal messages for them. With an academic focus on heat transfer, one of the team’s recent graduate’s, Alexus, has been especially motivated to learn about how thermoelectric modules can convert heat into electricity. For Connor, the team’s other recent GW graduate, this project has been all about “taking a concept from the drawing board to reality, from conception to completion, and how to deal with unforeseen challenges along the way”. This summer is expected to be an important time for their final developments. With testing commencing within the next month, Alexus, Connor, and Jack are looking forward to being in the lab this summer, working to get their model ready for competition day.